Are you getting published in your local media? Is your firm shaping the way opinion leaders and real estate consumers view critical issues in your housing market Associations, MLSs, and brokerages have access to the best local data ever available on trends in their local markets. Sales, prices, inventories, time on market—every day real estate professionals interpret these and other data to win the confidence of their customers and clients. You have a significant opportunity to turn market data into news that attracts business and establishes credibility. National data services like RealtyTrac and CoreLogic as well as sites like Realtor.com, Zillow and Redfin have perfected the practice of building awareness by creating news from their data. As a result, it is easier for consumers to track the non-existent “national” real estate market than their local marketplace. They are hungry for a better understanding of current trends where they live. Market trends aren’t always positive. Lower sales, falling prices, distress sales and tight inventories are part of the real estate business, but they can also generate negative coverage. If you are a credible source and on top of the market, you can mitigate potentially damaging data by putting it into perspective. Remember, the market is always working to someone’s advantage. Lower prices advantage buyers and first time home buyers. Distressed sales create opportunities for property management and investors. Tight inventories drive consumers to sign up with brokers for new listing notifications. Great communications programs highlight the good in everything. Your communications staff or PR firm can help you create news from local market trends, or you can turn to WAV Group Communications to create an effective communications program for your market. February home sales were stronger than normal as demand continued to reduce the average time that houses are selling in Ourtown, according to the latest data available to XYZ Realty. Lower inventories of homes for sale could reflect a national pattern that is creating unusual opportunities for sellers as the spring buying season opens. Sales rose 2 percent from January and now are running 5 percent higher than they were a year ago. New listings also increased 6 percent, but total homes for sale are still below the levels of 2015. 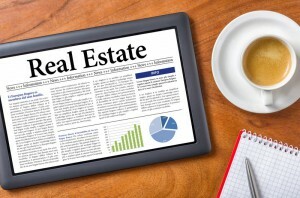 However active listings in February trailed last year’s levels by nearly 6 percent. This is a critical month because sellers who list at the outset of the spring season will reach early buyers. Moreover, early tracking of buyer interest indicates that the season is could begin weeks earlier than normal according to market activity reports from agents and brokers at XYZ Realty. While short supplies are good news for sellers, buyers must be prepared for stiff competition. First-time buyers may struggle to find a house since the number of homes in the lower-price market is severely limited. For entry-level properties priced below $150,000, Inventory fell 9.2 percent in January from a year earlier according to data from the Ourtown Multiple Listing Service. She urged buyers to get pre-qualified for mortgages, learn about neighborhoods they might like, monitor new listings closely and be prepared to wait for the right house. The sellers’ market is expected to attract more listings from those owners who are in a position to sell. XYZ Realty’s analysis suggests the opportunity for sellers will continue through the summer months since many owners are still hoping to recover equity lost during the housing downturn and are not in a position to sell. WAV Group Communications is a full service communications firm providing strategy, content, and public relations services. For a confidential overview of our capabilities, contact Kevin Hawkins. Steve Cook is a consultant with WAV Group Communications and is the Editor and co-publisher of Real Estate Economy Watch.